Transporting any type of firearm, real steel or airsoft, properly is a safety concern not just for you and your rifle, but also others. Until your boots are on an airsoft field or arena, keep your gun out of plain sight. High speed, low drag, low price, and the all around easiest way to getting your long guns from point A to point B. It features a unique design that incorporates a discreet internal flap that can be expand out of the carrying case's capacity to not just hold your standard 36" guns, but also extended 39" guns as well! 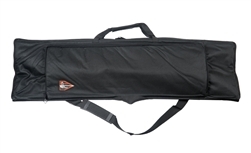 Made primarily out of a PVC material that is both durable and lightweight with soft cushioned padding lining in the inside compartments of the gun bag. Has 2 major storage options including the the expandable primary compartment as well as a secondary front compartment for smaller guns such as CQB or SMG type guns. Both feature Veclro straps that can be used to strap your gun down securely in the bag to reduce your guns jostling around when traveling. Features a reinforced grab handle for short trips from the car to the field or dual shoulder straps for that longer treks into the middle of nowhere the Lancer Tactical PVC gun bag can handle it all. Received as ordered , and in the time frame on delivery. The rifle bags I ordered were perfect for what I needed, with the extra pouch on each. The price was very reasonable. I tried to buy these carry bags at other sites, they were all out. Grateful to find a company who still had them in stock.